Kīlauea is a Volcano in the Hawaiian Islands, and one of five shield volcanoes that together form the island of Hawaiʻi. 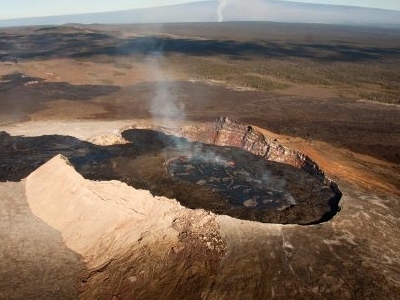 Kīlauea means "spewing" or "much spreading" in the Hawaiian language, referring to its frequent outpouring of lava. The Puʻu ʻŌʻō cone has been continuously erupting in the eastern rift zone since 1983, making it the longest rift-zone eruption of the last 200 years. Thirty-six eruptions have occurred since 1952. Lava less than 1000 years old covers 90% of Kīlauea,and the volume of erupted material is large enough to pave a road around the World three times.Kīlauea is one of the most active volcanoes on the planet and an invaluable resource for volcanologists who are able to study it up close due to its exclusively non-violent effusive activity. Since 2008, rising emissions of sulphur dioxide from the Halemaʻumaʻu crater at Kīlauea's summit have led to increased levels of volcanic smog and air quality concerns. Located within Hawaiʻi Volcanoes National Park, Kīlauea is visited by millions of tourists each year, making it the most visited attraction in Hawaii and the most visited volcano in the world.Despite its relative safety for researchers and visitors alike, Kīlauea is regarded by the USGS as the most dangerous volcano in the U.S.In 2010–2011, lava destroyed several houses in the Kalapana area.In March 2012, lava from Kīlauea completed the destruction of the Royal Gardens subdivision by burning the last remaining home there. According to the United States Geological Survey, the Volcanic-Alert Level for Kīlauea as of April, 2012 is "Watch". A Watch status is used to designate escalating unrest or a minor eruption underway that poses limited hazards. The volcano became a tourist attraction from the 1840s onwards, and local businessmen such as Benjamin Pitman and George Lycurgus ran a series of hotels at the rim, the most famous of which is the Volcano House, still the only hotel or restaurant located within the borders of the Hawaiʻi Volcanoes National Park. At the time tourism was a relatively new concept, but grew slowly before exploding with the advent of air travel around 1959, the year Hawaiʻi became a state. Today tourism is driven by the island's exotic tropical locations, and Kīlauea, being the only volcano in the world that is simultaneously active enough to be interesting, docile enough to be harmless, and carefully monitored enough to be approachable, is a major part of the island's tourist draw.In 1891, Lorrin A. Thurston, grandson of the American missionary Asa Thurston and investor in hotels along the volcano's rim, began campaigning for a park on the volcano's slopes, an idea first proposed by William Richards Castle, Jr. in 1903. Thurston, who owned the Honolulu Advertiser newspaper, printed editorials in favor of the idea; by 1911 Governor Walter F. Frear had proposed a draft bill to create "Kilauea National Park". Following endorsements from John Muir, Henry Cabot Lodge, and former President Theodore Roosevelt (in opposition to local ranchers) and several legislative attempts introduced by delegate Jonah Kūhiō Kalaniana'ole, House Resolution 9525 was signed into law by Woodrow Wilson on August 1, 1916. It was the 11th National Park in the United States, and the first in a Territory; a few weeks later, the National Park Service Organic Act was signed into law, creating the National Park Service and tasking it with running the expanding system. Originally called "Hawaii National Park", it was split from the Haleakala National Park on 22 September, 1960. Today the park, renamed the Hawaiʻi Volcanoes National Park, is a major conservatory agency and tourist attraction, and, since 1987, a World Heritage Site. Today, Kīlauea is visited by roughly 2.6 million people annually, most of whom proceed up the volcano from the recently revamped Kilauea Visitor Center near the park entrance. The Thomas A. Jaggar Museum is also a popular tourist stop; located at the edge of the Kīlauean caldera, the museum's observation deck offers the best sheltered view on the volcano of the activity at Halemaumau Crater. The Volcano House still provides the nearest lodging, and the nearby Volcano Village the most numerous; visitors associated with the military can find lodging at the Kilauea Military Camp. A number of hiking trails, points of interest, and guided ranger programs exist, and the Chain of Craters Road, Hilina Pali Road, and Crater Rim Drive provide access. Here's the our members favorite photos of "Volcanoes in Hawaii Volcanoes National Park". Upload your photo of Kīlauea!